Read Coretta Scott King's Letter That Got Sen. Elizabeth Warren Silenced : The Two-Way Warren was reading aloud from a letter by the widow of Dr. Martin Luther King Jr. when she was interrupted by the presiding chair of the Senate. 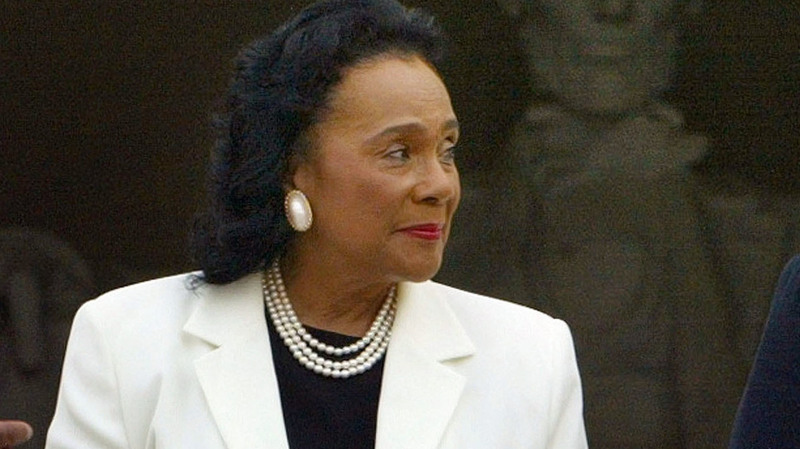 A nine-page letter written by Coretta Scott King is attracting new attention for its critical comments about Sen. Jeff Sessions. King, who died in 2006, is seen here at the Lincoln Memorial in 2003. Warren was reading aloud from the letter by King, the widow of Dr. Martin Luther King Jr., when she was interrupted by the presiding chair of the Senate, who warned her of breaking Rule 19, which forbids members from imputing to a colleague "any conduct or motive unworthy or unbecoming a Senator." The warning mentioned Warren's earlier quote of Sen. Edward Kennedy, who had called Sessions, then a U.S. attorney, a disgrace. But it was King's letter that — more than 10 minutes after Warren finished reading it aloud Tuesday night — prompted Majority Leader Mitch McConnell to call her out of order. That resulted in Warren being silenced on the Senate floor. In his objection, McConnell cited King's accusation that Sessions had used "the awesome power of his office to chill the free exercise of the vote by black citizens." Consisting of a short introductory note and a formal statement, King sent her letter to Sen. Strom Thurmond, who chaired the Judiciary Committee, in March of 1986. In it, she urged senators not to confirm Sessions — whose nomination did indeed fail. King's letter was posted online by The Washington Post. Early in her statement, King wrote, "Mr. Sessions' conduct as U.S. Attorney, from his politically-motivated voting fraud prosecutions to his indifference toward criminal violations of civil rights laws, indicates that he lacks the temperament, fairness and judgment to be a federal judge." Toward the end, she wrote, "Based on his record, I believe his confirmation would have a devastating effect on not only the judicial system in Alabama, but also on the progress we have made everywhere toward fulfilling my husband's dream that he envisioned over twenty years ago." The contents of King's letter have been circulating for some time now — it made headlines last month, as Sessions faced confirmation hearings for the post in the Trump administration.